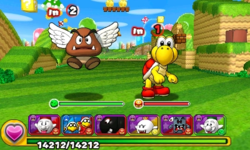 World 1-3 is the third course of World 1 in Puzzle & Dragons: Super Mario Bros. Edition. It is a basic, grassland level with enemies consisting of Goombas and Koopa Troopas. When the player enters this course for the first time, the game provides a tutorial for branching paths. Clearing this course once unlocks the Power Up spot at Toad Houses. This level starts with a single battle, after which the player reaches a branching path with a sign on the left and a red Warp Pipe on the right. 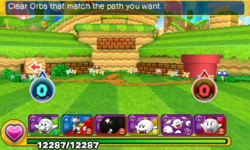 The left path requires the player to clear more Water Orbs than other Orb types, and the red Warp Pipe on the right requires more Fire Orbs to be cleared. 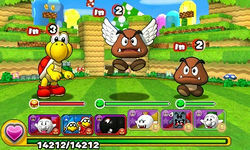 Taking the path on the left, the player faces two battles before the boss fight consisting of a Red Koopa Troopa, a Paragoomba, and a Goomba. Taking the red Warp Pipe down, the player enters a sky area and comes across a ? Block they can open for an item. After opening (or failing to open) the ? Block, the player takes another red Warp Pipe back to the main path and directly to the boss fight at the end. When playing this course for the first time, all three enemies for the boss battle drop items upon defeat: the Red Koopa Troopa drops a Fire Block, the Paragoomba in the center drops a P-Wing, and the Goomba drops a Wood Block. The boss battle of World 1-3. Red Koopa Troopa (Boss battle) ? 824 -- 35 2 ? ? Paragoomba (Boss battle) ? 1026 (484)* 1539 (Tackle) 17 2 ? ? Goomba (Boss battle) ? 738 959 (Bash) 17 2 ? ? The Paragoomba in the boss battle deals 484 damage when the player plays this course for the first time, but inflicts 1026 damage in any subsequent visits. When playing this course for the first time, the player fights a Paragoomba and a Green Koopa Troopa on the first battle and earns 120 XP and 2 Coins. In any subsequent visits, the player earns 102 XP and 2 Coins instead. When playing this course for the first time, the player is rewarded 415 XP and 15 Coins. In any subsequent visits, the player earns 384 XP and 7 Coins instead. ★World 1-3 is a difficult version of World 1-3 from ★World 1, with Light and Dark Orbs appearing on the Orb field, different items from the ? Block, and stronger versions of enemies. Interestingly, the "Enemies found here" listing has enemies in a different order. Red Koopa Troopa (Boss battle) ? 4862 -- 347 2 ? ? Paragoomba (Boss battle) ? 5279 7919 (Tackle) 199 2 ? ? Goomba (Boss battle) ? 3691 4798 (Bash) 173 2 ? ? This page was last edited on August 12, 2017, at 17:14.